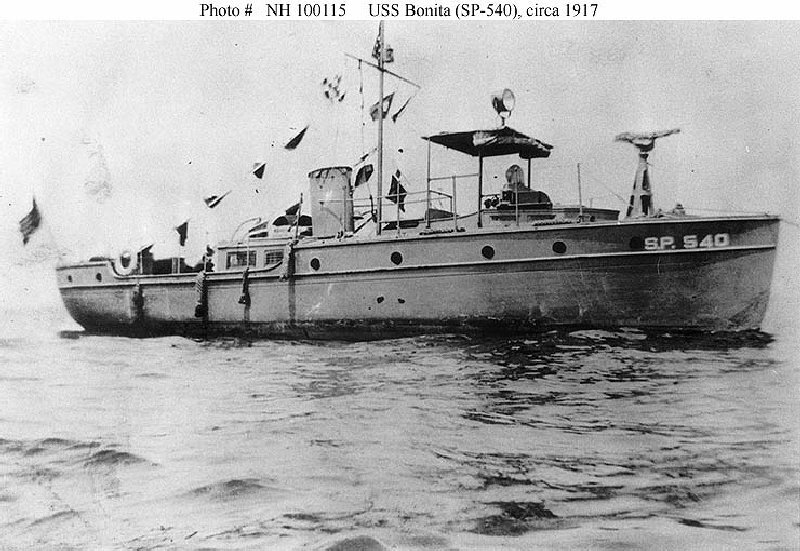 Motor Boat: Built at Mystic, CT; Acquired by the Navy in May 1917 and commissioned Bonita (SP 540) soon thereafter. For the rest of World War I she operated in Boston Harbor, Massachusetts, presumably on patrol and other security work. Struck by the fishing schooner Russell 26 November 1918 and sunk while moored astern at Coast Guard Station 25, Boston Harbor, MA. Specifications: Displacement unknown; Length 46'; Beam unknown; Draft unknown; Speed unknown; Complement unknown; Armament unknown. 113k Photographed circa June 1917, while on duty with the First Naval District. There is no DANFS history currently available for Bonita (SP 540).